As we approach the 50th Golden Anniversary of our beloved parish church Santuario de San Jose, we would like to take this opportunity to thank you profoundly for everything that you have done for us in the past as our founder and our builder, our parish priest and our spiritual father. 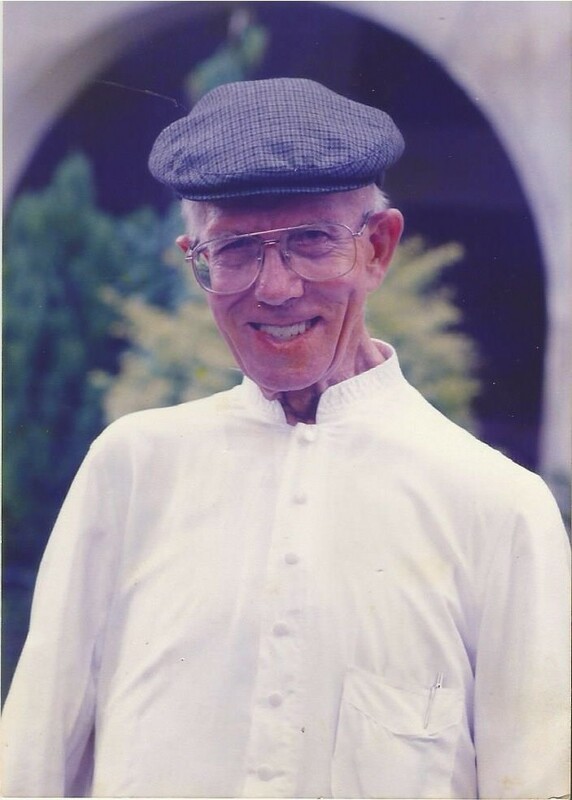 You have brought our entire family of four generations (and counting), relatives and friends, neighbors and parishioners, closer to the Church and closer to God through the sacraments -- your solemn masses and touching homilies, your availability for confessions and your compassion inside the confessional, your spiritual direction and advice for our families. Thank you for the countless baptisms and confirmations, for the weddings and anniversaries, extreme unctions and anointing of our sick, the last rites and poignant eulogies for our dearly departed. Thank you specially for the many confreres whom you were able to attract to a selfless life of poverty, chastity and obedience in service to God, as Oblates of St. Joseph, including our current parish priest Fr. Alex Magtibay. Thank you also Fr. Guido for the heavenly blessings you obtained for our persons and our property, and thank you for your winsome smile that cheered up our parish. It is indeed both auspicious and fortuitous that the year 2017 when we celebrate the 50th Golden Anniversary of our beloved parish church coincides with the new theme of the local Church “Year of The Parish” in preparation for the 5th centenary of the coming of Christianity to our country. So as we your parishioners continue to fulfill our mission of “leading our families to holiness, like St. Joseph” for the next 50 years, we shall not only strengthen our devotion to and invoke the intercession of St. Joseph, but we are now emboldened to seek your intercession as our “Beloved Parish Priest Forever”. Thank you once again Fr. Guido, on behalf of our family, parish and community, and as you continue to pray and intercede for us, now and then, please also smile upon us -- from your altar in heaven. The logo banners the name of the parish church “Santuario de San Jose” that is visualized by a photograph of the church façade on top of which stands an image of St. Joseph as the patron saint of the parish and patriarch of the universal church. The image of St. Joseph is taken from the stained glass window on the right side of the choir loft, entitled “Effects of the Redemption”, depicting his most joyous moment when his Son and our Lord and Saviour Jesus Christ resurrected from the dead. It is the most fitting image of St. Joseph to be used as the official logo of the parish because it evokes a multitude of meanings. His eyes gaze skyward and his hands are raised in adoration and thanksgiving to God and as a gesture of intercession for parishioners of Santuario de San Jose for our own faults and imperfections, and supplication for our petitions. 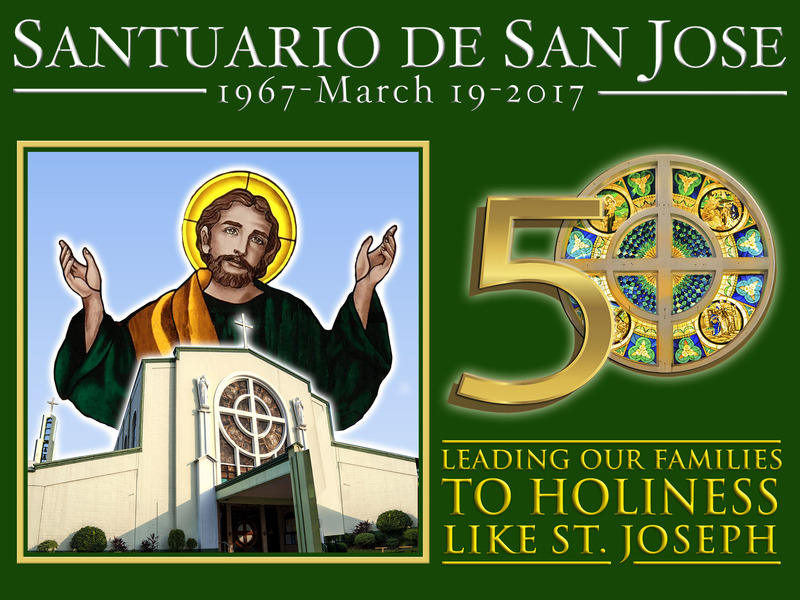 The number 50 represents the fifty years from 1967 to 2017 celebrated on the universal feast day of St. Joseph on March 19th. The “0” is taken from the the round stained glass window in the center of the church façade, the original window of the parish church from its inauguration.